Wesley Dennis was born in 1903, over a hundred years ago. His art captures the motion and facial expression of animals so accurately that people still enjoy his work today, and will for a long time to come. As a child, Wesley grew up on a farm in Cape Cod. He loved horses and was a natural artist. 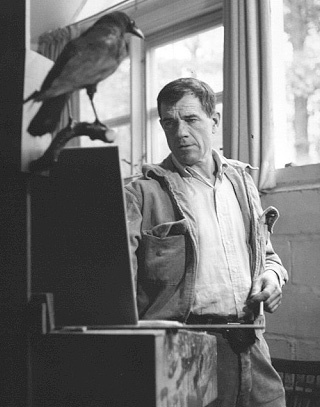 He knew that he wanted to be an artist surrounded by horses and other animals, and he carried out his purpose. He wanted to ride polo ponies, and left home at age 17. He got a job as a fashion artist, then did commercial art in advertising. To learn about painting horses, he found a teacher in France and left his job to go there. His teacher, Lowes Luard, taught him to draw from memory and with accuracy. He also sent Wesley to butcher shops where he studied how muscles are attached and what they are used for–on horses (since French people ate horse meat). He loved the personalities and graceful movements of live horses, and started drawing horses at racetracks. He made a set of drawings for a famous actor and singer, Bing Crosby, who bought them all. 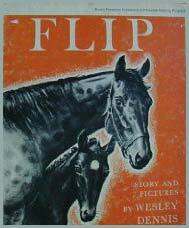 In 1941, Wesley published his first horse story, Flip, a beginning reader about a colt who wants to jump a stream like his mother. Then he wrote Flip and the Cows. Marguerite Henry was searching for an illustrator for her book, Justin Morgan Had a Horse. She didn’t like any of the samples of art the publisher supplied, so she went to the library and looked at children’s books. There she found Wesley Dennis’ book, Flip, and she knew he was the one. When Justin Morgan Had a Horse was published in 1945, Wesley became famous, and remained famous (and hard working) for the rest of his life. His illustrations were funny and true to the animal at the same time. The same year, Wesley visited friends in Warrenton, Virginia, who convinced him to move there. He bought a 120-acre farm where he kept horses, ponies, dogs, ducks and a pet crow named Charlie. He went on a safari to Africa with the same friends. Two years later, in 1947, the next book he illustrated for Marguerite, Misty of Chincoteague, was published. In 1948, King of the Wind was published. Can you imagine researching, writing and illustrating whole books every year or two? This book won the American Library Association’s Newbery Medal Honor Award. The book tells one of the best horse stories you could find. Agba was mute. That means he couldn’t talk, and as a slave, he had no freedom. But he nurtured this colt who became a great race horse, an ancestor of today’s thoroughbred racers. This story shows how a child’s courage and determination, and his love for and belief in a horse, can help him overcome what seems like impossible challenges. Together the horse and boy succeeded and became winners. In 1946, Wesley illustrated Black Beauty, a very popular horse story. John Steinbeck, who won a Pulitzer Prize, asked Wesley to illustrate his book, The Red Pony, in 1948. In a 1956 interview, Marguerite said, “This artist saw beyond hide and hair and bone. You could see that he loved animals, that he was trying to capture their spirit, personality and expression.” Marguerite worked with Wesley for twenty years. He illustrated 150 books, and was enthusiastic and energetic about everything he did. Over ten million copies of his books have been printed in ten languages. He painted portraits of horses, dogs and people, and illustrated many things, like magazines and cartoons. Like Agba in the King of the Wind story and Paul and Maureen in the Misty story, Wesley Dennis used great determination and energy to reach his goals. Whatever your goals are, you can try doing that too! People who get good at drawing (or anything else) spend a lot of time drawing—like ten thousand hours. So if you want to learn to draw—draw a lot. If you’d like to start with simple drawings, Ed Emberley books help you use basic shapes for drawing funny animals in a simple cartoon style. You can find guides for drawing more refined horses on YouTube, by entering the search term, “how to draw a horse step by step” in the empty box at the top of the web site. Then you can tell which videos people like the most by looking at how many times people watched them.